The highlighted tweet on the right is mostly neutral, and the repsonses had almost equal positive and negative sentiments. Although the selected tweet is mostly positive, it is interesting to find the the replies are mostly negative. This selected tweet is more controversial, which is mirrored in the mostly negative responses. Throughout his presidential campaign and continuing into his presidency, Donald Trump has utilized social media, specifically Twitter, to bypass mainstream media and speak directly to his followers in a way that has never been done by a president before. This same technology also allows Twitter users to respond directly to President Trump's tweets in real time and on an equally unprecedented scale. A lot has been said about what President Trump tweets to the world, but not much is said about what the world tweets back. 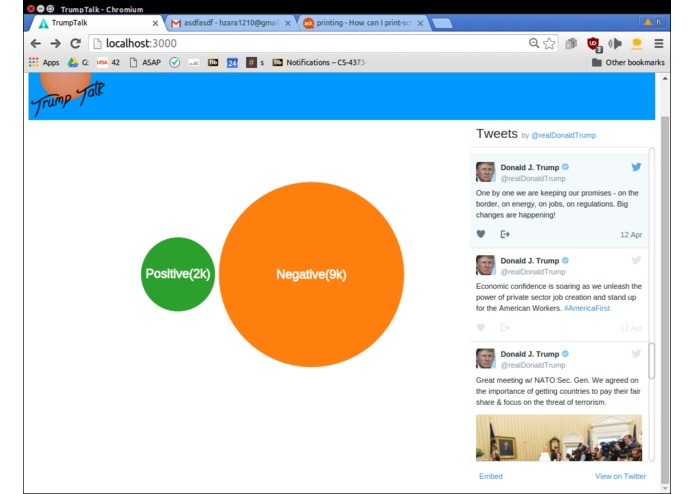 Trump Talk is a web application that provides real-time sentiment analysis on the responses to President Trump's tweets, filling the gap between POTUS and his constituents. Trump Talk is an interactive tool that allows users to easily observe and understand the general sentiment in response to President Trump's tweets. 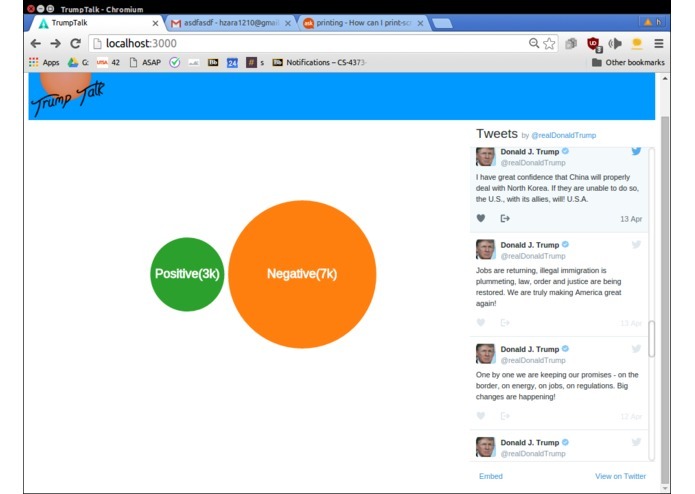 Trump Talk clearly displays the number of positive and negative replies to the selected @realDonaldTrump tweet, allowing users to analyze for themselves the response to POTUS' most used social media tool. We used an open source web scraping tool to grab the tweets of President Trump and the replies to those tweets, which were then stored in a PostgreSQL database. We then interfaced with Google's Cloud Platform API to perform sentiment analysis on both President Trump's tweets and the replies to the tweets. Each tweet was given a score from -1 to 1, with negative scores representing unfavorable sentiment and positive scores showing favorable sentiment. 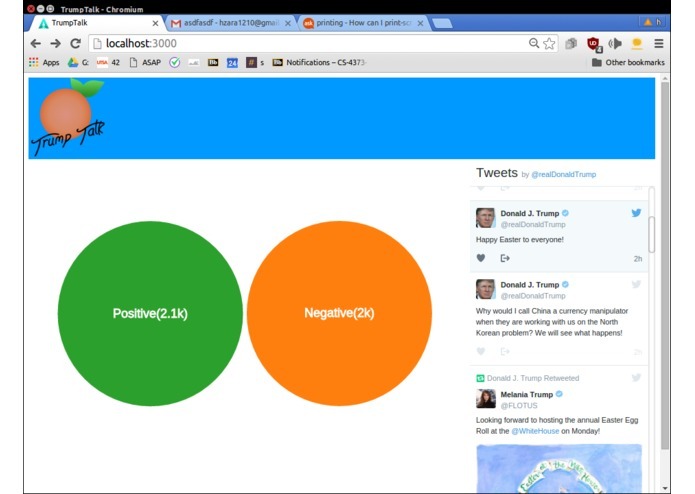 We then utilized this data to create a web application using Ruby on Rails that allows users to easily visualize the number of positive and negative replies to each of Trump's tweets. Each of us were challenged with the task of learning how to use the open source libraries, tools, and technologies we needed to create Trump Talk. We were originally going to use the Twitter API to gather our data set of tweets but we had to instead use a web scraper because the free version of the API had limited functionality. We also had to pivot from our original idea, a heat map, once we realized that Twitter did not store enough location data to be useful for us. Only one of us had experience with front end development and Hector had to carry us on his broad shoulders once the back end work was done. Though at times things got rough, we resisted the urge to kill each other and none of us abandoned the others. We're proud that we were able to create and (mostly) successfully implement an interesting and novel concept. That visualization is important and more time should be invested in learning front end development. We hope to further analyze the data and use it to create a fully functioning website that can be used to visualize data in several dimensions. Helped research and debug open-source Twitter scraping tools used to import the desired tweets into the postgreSQL database. Also helped to create Trump Talk logo. to determine the sentiment of those tweets. Initial implementation of tweet aggregation using twitter's REST APIs. 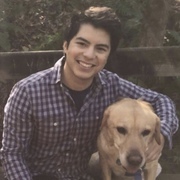 Created and hosted PostgreSQL database and tables on home computer, helped research and create the script that would scrape Twitter for Donald Trump's tweets along with the corresponding replies. Software Developer at Hewlett-Packard Enterprise. Blockchain Enthusiast.